SAN JOSE, CA – July 21, 2011 - OCZ Technology Group, Inc., (Nasdaq:OCZ) a leading provider of high-performance solid-state drives (SSDs) and power supplies for computing devices and systems, announces the ZS Power Supply Series that offer consumers superior value for home desktops and gaming systems. Providing high efficiency, cool operation, and a compact case design, the ZS Series offers an excellent price point for system builders looking for a quality upgrade in a variety of power options. The ZS Series is ideal for system builders and gamers, and is capable of powering dual-GPU platforms equipped for NVIDIA® SLI™ and ATI CrossFireX™ modes. The PSU is kept cool under heavy usage with a large temperature and load-controlled 135mm double ball-bearing fan, and this high-efficiency PSU also meets strict 80-Plus® Bronze energy saving requirements by converting up to a full 85% of AC to DC power at typical loads. Furthermore, the ZS Series complies with ErP (Energy Related product) Directive to ensure less than 1W of power is used in passive standby and off modes. 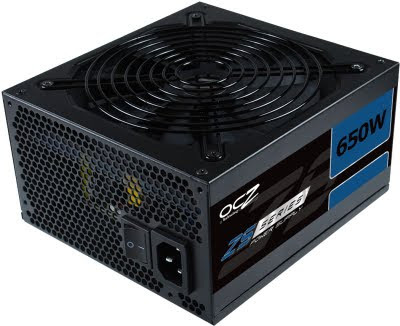 The OCZ ZS Series will be available in 550W, 650W, and 750W models, and all ZS Series power supplies come backed with a three year OCZ PowerSwap Warranty for the ultimate peace of mind.